Project from Slovakia released on Slowcraft Records (UK). Written and produced by Lukáš Bulko. My name is Lukáš Bulko. 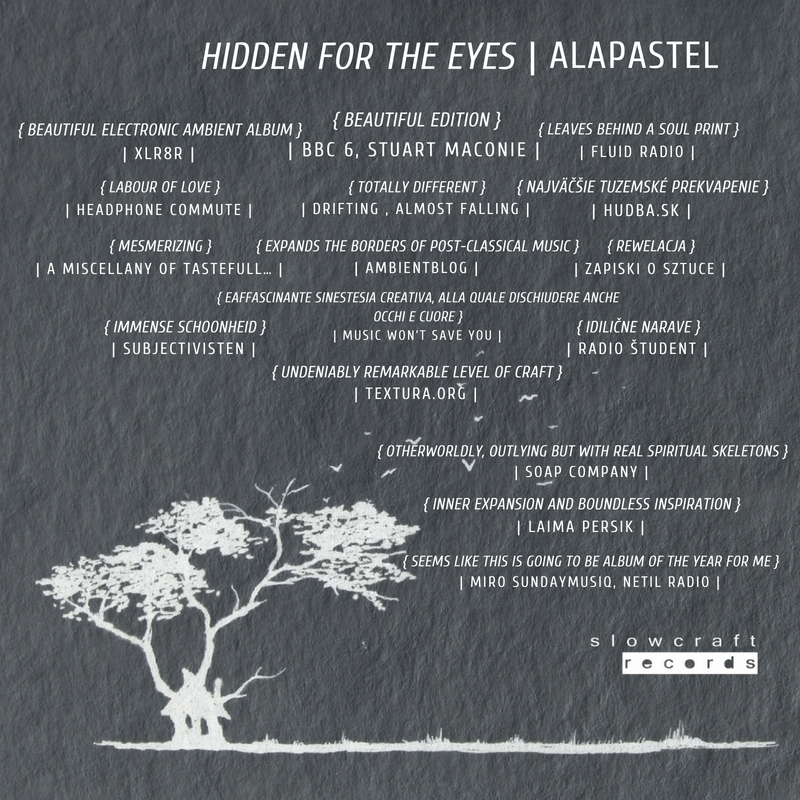 Last year, London based "Slowcraft records" released my debut album "Hidden for the Eyes" as opener of ‘exceptional, unclassifiable music’ edition. It was full eight years of making and tries to capture the worlds that exist beyond our limited perception capabilities. It was recognized and praised at 54 different sites worldwide, including BBC6, XLR8R, Bandcamp daily ("Ten Musicians Updating Electroacoustic Music for the 21st Century"), Red Bull Music UK("8 essential ambient artists you need to know"), Fluid Radio, Headphone Commute and many more (https://alapastelsite.wordpress.com/press-radio/) Journalists wrote for example: “Alapastel expands the borders of post-classical music.”(ambientblog), "Alapastel is a labour of love"(Headphone Commute), "leaves behind a soulprint." (Fluid Radio). Music was compared to artist like Nils Frahm, Olafur Arnalds or Max Richter. The very first concert was at showcase festival Waves Vienna 27.9.2018, where we were invited, we played support for God Is An Astronaut and we played live at concert hall of Slovak National Radio. We would love to play live in some peaceful venues for people who treasure music made with honesty, integrity and depth. I work with experienced and respected musicians, who actively playing live for many years. We can offer you very advanced electro-accoustic performance. The musicians are: Adam Dekan (Multi-instrumentalist , active modular synthesist, producer and runner of bands Sine Ray, Núku, Gladia Moony and others, active since 2009), Marián Hrdina (male opera singer, member of Slovak National philharmonic choir), Alex Lukáčová (musician and singer in bands Núku and Gladia Moony).